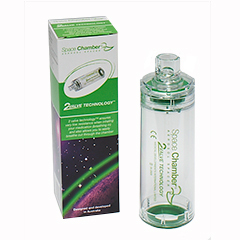 2 Valve Technology is desgined to provide low resistance when inhaling medication and allows patient to easily breathe out through the chamber. Transparent chamber means patients can see valves working properly. Recommended for delivering asthma and COPD medication with most brand/type/size of pMDI. Integrated insert in the base does not dislodge on withdrawing of pMDI. Not made with natural rubber lates. Multiple patient use, can be autoclaved up to 50 times at 134oC for 3 minutes.